Celebrate Earth Day with your neighbors and friends by volunteering to clean up your local park! Join this community-wide volunteer effort to make a difference. 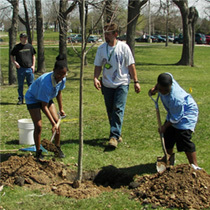 Earth Day Challenge Projects are held all throughout the city. Volunteers may assist with trash pickup, raking, weeding, and removing sticks. We will supply gloves, garbage bags and rakes.